This perennial herb rises 1-3 feet up from thick, meaty rhizomes at the ground, with stem nodes swollen like arthritic knuckles. Two-inch flowers are scattered atop, often nodding tipsy above the leaves, their five round petals ranging from gentle pink to an earnest fuchsia. In time the blossoms give way to fruit capsules, their styles elongating into a distinctly pointed 1-inch 'beak' that eventually splits open, catapulting the seeds out and away from the plant. Pow! Genius. Leaves are palmate, with 5-7 toothy lobes divided almost to the base, arranged opposite along the flower stem and then alternating below. The bracts (below the flowers), upper stems and leaves are glandular and sticky. We wouldn't go so far as to say "gooey"...they feel more like they've been sprayed with an aerosol adhesive and never dried. There are seven Geranium species in Montana, the most similar being G. richardsonii, the White Geranium, whose flowers are...white. But before you get too comfy boasting your botanical prowess, remember that this genus is notoriously difficult to label. If you're picky-picky (I am not) check out SW Colorado Wildflowers' awesome article on the nitty-gritty details of telling geranium species apart, along with other interesting taxonomic morsels. Found commonly in foothills to montane, from south-central BC and Alberta to Colorado, Utah and Nevada. Like me, this species is not picky, and will be found in forests and prairies and open meadows, dry or soggy, shaded or in full reach of the sun. In 1753, Linnaeus chose the genus name Geranium from the classical Greek word for a crane, geranos, in reference to the long beak-shaped fruits of late summer...today you'll often hear geraniums called "cranesbill" or "storksbill," The species name viscosissimum points to this species' sticky leaves and stems. Viscum is the late Latin name for birdlime (a sticky goo spread on twigs to trap little birds) and ultimately comes from the ancient root weis-, meaning to melt or flow away. Incidentally, the good old All-American Geranium we know and love (or loathe, depending on our moods), stocked so liberally in garden centers and windowboxes across the country, is not a geranium at all but rather a Pelargonium, evergreen and native to the tropics. Sticky geraniums have a luxuriously long bloom time, opening blossoms dependably from May to August (depending on elevation of course). This past fall (2016) was delightfully long and warm in central Montana, extending the blooming season clear into November. As with most of our native species, the plant has a lengthy list of long-ranging medicinal uses. It's edible but astringent and reportedly "unappealing". We also need to take care not to confuse geraniums with monkshood (Aconitum columbianum), whose leaves are very similar and very poisonous. And finally...are geraniums carnivores? May well be. You'll certainly find wispy little bugs stuck on them, and to me that's an indicator that at least something's going on. And some 20 years ago, a certain G. G Spomer's studies pointed to the fact that G. viscosissimum produces an enzyme capable of breaking down and digesting proteins. As with everything, the question begs more study, but if you're interested you can check out his piece and see for yourself (Spomer, G.G. (1999). Evidence of protocarnivorous capabilities in Geranium viscosissimum and Potentilla arguta and other sticky plants. International Journal of Plant Sciences, 160(1): 98-101). This is an excellent choice for native landscaping, as it's tolerant to a wide range of conditions and quick to produce blooms. It's relatively easy to grow from seeds using a cold moist stratification method, but remember that the ripe fruits actively toss their seeds onward and outward, so collection can be tricky. On the other hand, vegetative propagation through cuttings and rhizome divisions is a snap in the spring. Give them dappled shade and not much water, and sit back ready to watch the pollinators come running. Sticky geraniums are a great venue to observe all kinds of fascinating insect species...bees and beetles and butterflies all love them. The petals are lined with dark-hued stripes that reflect ultra-violet light and guide insect towards the nectar source. Here, a scarab beetle that's evolved to mimic a bumblebee poses happily for a photo. The resemblance is striking, but you can't fool me! 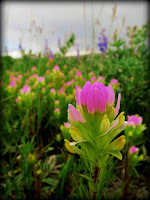 Castilleja blooms in early summer in a wild assortment of reds, oranges, pinks, yellows, even purples. The colorfully painted brush atop each plant is not actually the flower, but rather the plant's leafy bracts that gradiate to green towards the base. The actual flowers at the tips of these petal-like leaves are not much to speak of. 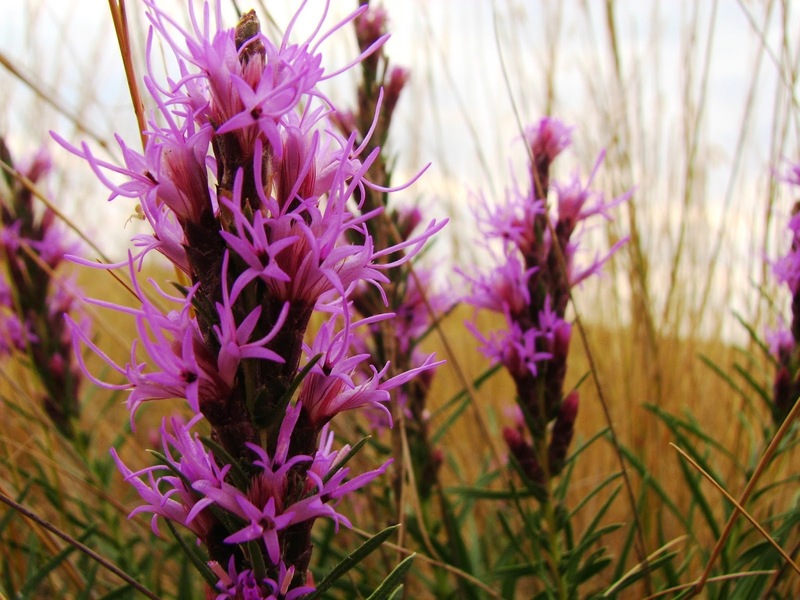 Paintbrush tends to be a moderately sized perennial herb, upright and with a woolly quality. The narrow leaves are alternately arranged, without stalks, clustered along a stem that can get woody at its base. Castilleja could easily be confused with the closely related owl clover (Orthocarpus) or even the not-closely related Liatris, if one isn't careful. 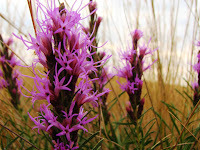 Liatris (right) and owl clover above...both native, neither one a paintbrush! At any rate, the species can be exceedingly difficult to tell apart, as they hybridize easily. Even the most authoritative taxonomists in the business use caution with this genus. Around 200 species of Castilleja evolved in the Americas and northern Asia. Most of the diversity is found in the Northwest region of the US and Canada, although species range down to the Andes. Plants grow in a wide range of ecosystems. Look for them in forest meadows, rarely in dense stands but instead sprinkled in among other wildflower communities. One used to commonly hear this plant called Indian paintbrush (although most gardeners and botanists I know have come to find the term distasteful) or prairie-fire. The genus name Castilleja was first published in Carolus (the younger) Linnaeus's Supplementum Plantarum in 1782, after Professor of Botany Domingo Castillejo of Cadiz, Spain. The name was chosen by Jose Celestino Mutis, a world-class botanist in his own right, who must have been one of Castillejo's admirers. The surname, incidentally, means "little castle". Fischer (2004) considered the family to consist of three subfamilies; Antirrhinoideae, Gratioloideae, and Digitalidoideae. He further divided the Gratioloideae into five tribes; Gratioleae, Angeloniaeae, Stemodieae, Limoselleae and Lindernieae. He then divided the Gratioleae, with its sixteen genera (and about 182 species) into three subtribes; Caprarinae, Dopatrinae and Gratiolinae. The Gratiolinae had ten genera (about 121 species) distributed through temperate and tropical America; Bacopa and Mecardonia (formerly Herpestis), Amphianthus,Gratiola, Sophronanthe, Benjaminia, Scoparia, Boelkea, Maeviella and Braunblequetia. Many of these were transferred to the family Plantaginaceae, in the tribe Gratioleae. Yikes! While some folks, bless their hearts, really get excited with this level of nit-picky detail, the rest of us are left throwing our forever-outdated field guides up in the air, exasperated. What's cool about the binomial nomenclature system (Genus species) is that everybody all over the world can use the same name for an organism, no matter what language you speak or what region you hail from. Nice and simple. All the new (yes yes, more accurate) swip-swapping of names can get complicated, and intimidating for the budding botanist. At any rate Castilleja, formerly a scroph, is now in the Orobanchaceae (Broomrape) family. This actually does make sense, as the broomrapes, like paintbrush, are largely parasitic plants. Castilleja is what's known as a hemiparasite. Unlike true parasitic plants, it has the chlorophyll to photosynthesize on its own. It can even live on its own, but will be stunted and miserable. It would much prefer to worm its haustoria (special roots for plants looking to borrow a bit from their neighbor) into their host plant's root system and pick up a little water- and nutrient-boost. I thought Tracey Switek's post in The Olive Tree explained it really nicely, so give it a look-see to learn more about paintbrush's fascinating parasitism. And before you cast it aside as a thieving rascal, take heart in the benefits the paintbrush brings to its environment. Besides the utterly lovely burst of color it provides, this is an excellent pollinator plant, full of nectar and visited by all manner of bees and hummingbirds. It's also an important larval host for Schinia moths and checkerspot (Euphydryas) butterflies. The flowers are theoretically edible for people too, and have historically been used to treat various ailments (including love-sickness). The plant's tendency to accumulate potentially-toxic levels of selenium in the leaves, however, means would-be foragers should go forth with caution. Because paintbrush naturally grows in complex relationship with other plant communities, it's notoriously difficult to cultivate in the garden. But not impossible! Collect seed capsules midsummer to fall and dry them in paper bags. Try giving the seeds a month or so of cold moist stratification...different species will respond to this treatment differently. You could also try sowing seeds outdoors in fall so they're exposed to naturally fluctuating temperatures. Start spring seeds in pots or again, try sowing them straight into the ground. You should see germination within a couple weeks. A host plant is not required to get seeds to germinate, but your paintbrushes will languish soon without. Your best bet is to grow it near other native plants that it would be found alongside in nature. 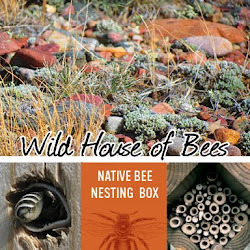 Time to start building that native wildflower meadow you've always wanted! Good luck! This wild spirea is usually classified as a shrub, although it doesn't typically take on the shrubby, fit-for-a-hedgerow form of its fancy cultivated cousins. It is a showy little flower though, borne on a woody stem whose bark tends towards cinnamon colors and gets a bit shredded with age. The leaves are alternate, oval with coarse teeth along the tips, mellow green with pale undersides. Don't mistake the leaves for those of serviceberry (Amelanchier alnifolia), which are more heart-shaped at the base. And don't mistake the flowers for yarrow (Achillea millefolium) either! Birch-leaved spirea flowers are creamy off-white, arranged in flat-topped clusters called corymbs, and have waggly little stamens that reach out past the petals like so many antennae. The whole shebang is generally around 18" tall but grows up to 30" in some places. Birch-leaved spirea has a showy cousin (Rose Spirea, S. douglasii, aka hardhack) that's a treat to find. The flowers are a rich pink, arranged in sweet ice cream cone-shaped panicles. Look for it forming dense riparian thickets up to 6' tall in the far northwest corner of Montana. Look in mid-elevation foothills and montane zones of the intermountain west. Eastern WA and OR, western MT, southern ID, even in the Black Hills of South Dakota. Here in Montana, I think of Doug Fir, Lodgepole and Ponderosa slopes, dappled shade, Ninebark understory. This is a very adaptable wildflower, growing in moist or dry sites, out in the open or in shaded forests, from the foothills to the subalpine zone. The common name spirea (pronounced spy-REE-ah) comes from the Greek speira for spiral or anything twisted, and references this flower's long tradition of gracing garlands. The species name betulifolia literally means "birch-leaved," and the leaves do indeed look a bit like a swamp birch. There are quite a few species of Spiraea, and many of them are known colloquially as "meadowsweet." Spirea contain salicylates, which are the naturally occurring predecessors of our modern day aspirin. They were first isolated from the meadowsweet now known as Filipendula ulmaria, which was once classisified as a spirea...hence the name, aspirin! I first decided to write about birch-leaved spirea because of the drought. Last summer (2015) western Montana had...no...rain. Effects on the local flora were impossible to ignore. An extremely warm winter followed by a bone dry spring sent the wildflowers into a panic. Fearing doomsday, they flowered and set seed as fast as possible, leaving us botanists harumphing. We started picking huckleberries in early June, and full six weeks too soon. By early August the fall colors were already crackling in the 100°+ heat. A dry and crispy summer where it seemed hardly anything kept its will to bloom...except spirea. The birch-leaved spirea seemed to be doing fine, even thriving. I can only imagine how happy the pollinators were for that sweet, elusive sip of nectar. Spirea grows and spreads from its super-strong rhizomatous root system, rather than seeds, for the most part. If you want to propagating it, try root stock or even layering stems. Try part shade, although it's pretty adaptable. Deer will eat it, but they don't LOVE it. The USFS Fire Effects Information System (a SUPERB reference, btw) lists it as fair to poor forage for all the large grazers. As a mid-summer bloomer, the native bees absolutely adore spirea, and you can always find a host of interesting bugs investigating the landing-pad flower tops. Spirea has always made me think of granny cottages and comfy summer afternoons, both of which I love.